Its 7 am, mid March I arrive at the Chilliwack River with my client Rodger. We walk in a couple of hundred yards to our first run of the day only to find that it is already occupied by two other anglers that I happen to know. After a brief hello the other anglers let me know that they are just about to move on as they have not hooked any steelhead yet. As they are leaving I notice that both anglers are fishing ghost shrimp, a usually deadly steelhead bait. Rodger asks if it worth it to cover this water as it has already been fished. I tell him that first water is a good thing by it is not always critical and that this run is worth fishing as it very rarely does not produce a fish or two. We start at the top of the run with a small Jensen egg and wool combo, this bait is different from the previous anglers offering in size and colour and I work with Rodger to make sure he covers the run thoroughly. After about 15 minutes and no takes we start at the top again with some boraxed steelhead roe and recover the run again thoroughly, 15 minutes more still no bites. O.K. time for an impact bait, on with the pink worm! I tell Rodger that we will spend only half as much time with this bait and to work this through the run quickly. After about 5 or 10 casts half way down the run the float drops! Fish on! A big wild chrome buck explodes out of the water, after a very spirited 15-minute battle the big steelhead surrenders for a quick photo and a fast release. A great start to any day of winter steelheading. 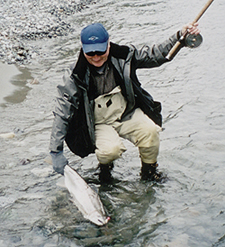 Steelhead fishing is probably the Holy Grail for all river anglers. There is just no other fish that swims the rivers of British Columbia that is more revered, respected and admired then the Steelhead. 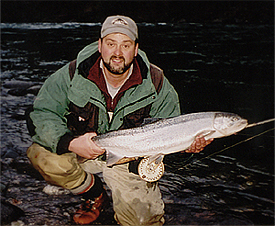 For many anglers the steelhead is an elusive prize that seems to always be just out of reach. Steelhead anglers that are successful do tend to be rather tight lipped in regards to their success and with good reason. Catching steelhead consistently requires experience and time spent on the river to get in to the "groove" or getting a feel for what the fish are doing and what the river is telling you. Anglers that only fish a day here or there are only likely to catch the occasional lucky fish. Unfortunately not all of us can spend two or three or more days a week, fishing our favorite streams looking for steelhead. Fortunately Steelhead are really not as hard to catch as many would have you think and there are few basic strategies that are used by successful anglers that are consistently over looked or not properly applied by the majority of other river anglers. While this basic theory can be applied to any form of angling be it fly-fishing or gear fishing this will be directed at the standard and popular float fishing technique. Here is what I refer to as the Run and Gun approach to angling for winter steelhead. It works for me and I know it will work for you too! There are three basic components to this approached and they are all common sense but all equally important. First, cover water, second the KISS concept; keep it simple stupid! And third, be organized. Revolutionary its not but you would be surprised how following all of these steps EVERY time you fish will increase your success ratio. Covering water is very important, as this is not salmon season where there will be a continuous stream of fish flowing by you all day long. Salmon runs can number in the thousands daily where as the steelhead runs may only be a few thousand for the whole season. Because of this Steelhead have the option of picking the best and most preferred spots in the whole river. The bottom line is that you have to put some miles on your wading boots and wear out some felt! As a rule I will generally not fish for more than one hour in a spot and I am in and out of many spots in 30 minutes or so. Always try new water every time out because over the course of the season you will find more and more fish producing water to add to your own "circuit" and after a while you will put together a series of spots to fish that will consistently have fish in them and that is when you become one of those guys that always seems to have the Steelhead touch! The Kiss factor: Keep It Simple Stupid! Steelhead are fish and nothing more. Honestly, steelhead are usually easer to get to bite than salmon, there are just a lot less of them. Every one is always talking about the hot bait; but I have news for you: it all works, just at different times. Fish are like people; we don't all eat the same thing at the same time so you have to have options. However to many options is confusing and take up to much room. Personally I have my baits listed in three categories, First organic baits such as roe or ghost shrimp, second small artificial baits like wool ties, Jenson eggs, spin n glows and gooey bobs and third Impact baits like Colorado blades and Rubber worms. You really don't need much more and also, remember that you have to carry this stuff with you all day long! Finally, be organized! Our time on the water is precious so have your rod rigged and have everything checked out the night before. I have all my baits and hooks pre tied with a snap tied to the end for quick bait changes. The less I have to mess with on the water the better! This seems so basic, and it is, but this will catch you more fish. Pre tied baits are easer to change on the water and after you have been fishing hard for most of the day it is easy to slack off and not change up baits especially if you have to tie them every time. Pre tied baits with snaps already attached on leader boards are easy to change and thus more likely to be changed up. Trust me it works! So now lets put it all together. Start each day with a plan; gather as much info as possible on the latest reports and water conditions, and decide on the spots you want to fish that you know and also a couple of new spots that you have not fished recently. When you arrive at your first run, pick one of your bait selections either organic or small artificial and cover the run from top to bottom thoroughly then go back to the top and change up baits to the opposite of what you started with and recover the same water again top to bottom once again thoroughly. Now that we have covered the water completely with an organic bait and a small artificial bait, it is time to cover the same water again with an impact bait (Rubber worm or a Colorado blade) except only spend about half as much time covering the water before you move on. The secret to fishing impact baits is to fish them fast and fish them last. You should expect to cover between 4 to 8 different pieces of water this way every time you are on the water hunting for Steelhead. Remember Steelhead are like people; they do not all bite the same stuff at the same time, so we need to show every fish we come across at least three options and we need to show as many fish as possible our baits so we need to cover lots of water. Many anglers are content to fish one or two different spots and very rarely change their baits, but they also catch very few Steelhead, for the angler who is willing to put out some effort and give the Run and gun method a try you will be rewarded with more steelhead, this I can personally attest to. Steelhead fishing is challenging and very rewarding. Steelhead are the premier game fish that our waters have to offer so why not put out that extra effort next time and give your Steelhead angling that run and gun advantage!